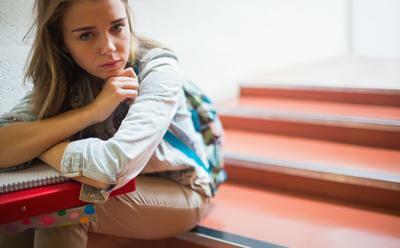 Students who feel lonely are at greater risk of developing mental health problems, according to a new study led by the University of Southampton. Psychologists surveyed 454 undergraduates from across the UK over a year and found that the greater their feelings of loneliness the more likely they were to experience an increase in anxiety, stress, depression and general mental health problems over that time. However, the study, carried out in partnership with Kingston University, found no evidence that mental health problems led to an increase of loneliness itself, and little relationship was found between loneliness and alcohol problems. The exception to this was that feeling lonely was found to increase the risk of eating disorder symptoms – for example, being preoccupied with your weight. Those with higher symptoms of eating disorders were also more likely to feel lonely over time, suggesting a ‘vicious cycle’. Lead author Dr Tom Richardson, of the University of Southampton, said: “Previous studies have looked at factors that might increase loneliness in students, such as internet addiction, but this is the first time that the relationship between loneliness and mental health among British students has been highlighted. The authors of the study, published in Journal of Public Mental Health, suggest that universities should consider social interventions to reduce feelings of loneliness. Loneliness is defined in the study as ‘an individual’s subjective perceptions of deficiencies in his or her network of social relationships’, and was measured by a standardised three-item measure asking questions such as ‘How often do you feel left out?’. The authors point out that there is a difference between being socially isolated and feeling lonely, and that one does not necessarily follow the other.